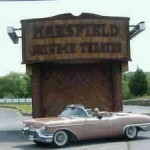 Please enjoy our list of drive-in movie theaters in Connecticut. 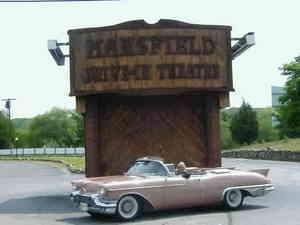 The Mansfield Drive-In Theatre provides three double features per evening on its three screens. They are especially family friendly, having a playground for children while you wait for the sun to set (the playground closes when the movie starts). They also host the largest flea market in eastern Connecticut on Sunday afternoons. 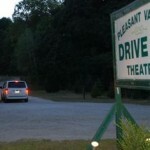 The Pleasant Valley Drive-In offers a single double feature every night from Thursday to Sunday. A new lineup of movies starts on Friday nights (in other words, Thursday shows the movie from the previous weekend). The drive-in is cash only, so make sure you bring enough for the whole family. 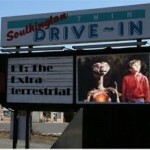 The Southington Drive-In is something unique: it is a community drive-in. After having closed in 2002, the citizens of Southington decided that losing their drive-in would be a loss to their community. 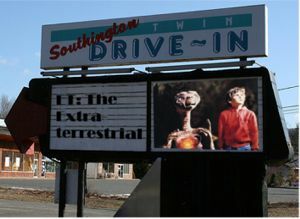 As a result, the town purchased the drive-in, and it has been run by the “Southington Drive-In Committee” ever since. 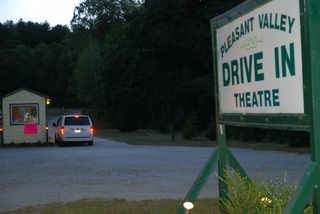 Because it is a community, non-profit drive-in, it has lower prices than many other drive ins. However, it does not show first-run movies, but rather classics like “Jaws” every Saturday night, and does not show “R”-rated movies. It also shows one feature, not a double feature.